Vietnam vet and POW returns home to Texas to finds a lot’s changed while he’s been gone, and things only get worse, prompting some hook-inspired violence and mayhem. 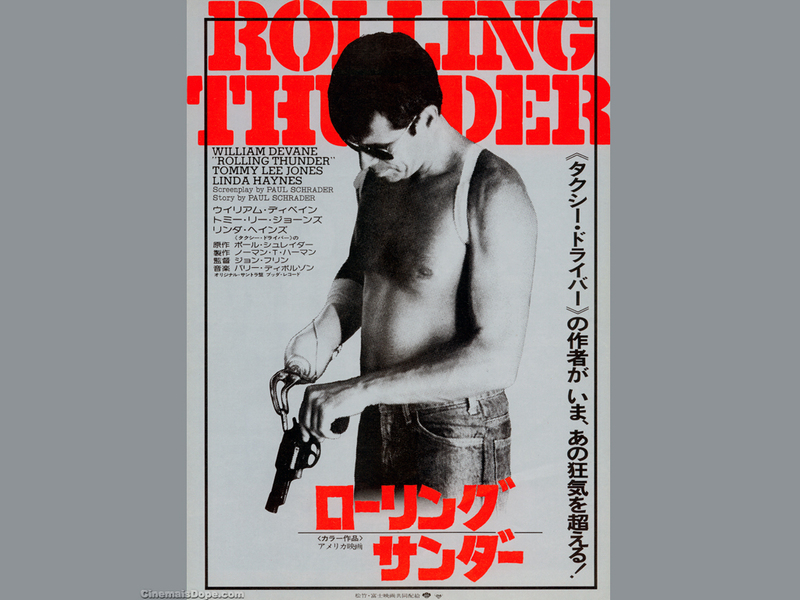 Rolling Thunder is a real curiosity of a film. A simple revenge fable with an odd sound design, a gay sub-text for the wannabe academics, and Sheriff Roscoe P Coltrane from The Dukes of Hazzard TV show, James Best himself, as the bad guy. Charles Rane (William Devane) and Johnny Voden (Tommy Lee Jones) return to a hero’s welcome after a grim time imprisoned in Vietnam. Both hiding behind dark sunglasses, they awkwardly say goodbye and return to civilian life – Voden to his uninspiring family and bra-less, jiggling girlfriend, and Rane to a Mrs who has been having an affair and a son who can’t remember him. Still, nevermind aye, as his unfaithful wife and anonymous boy are quickly killed by James Best and his very bad friends who are looking for a few thousand dollars Rane publicly received to get himself back on his feet. They also stick his hand into a waste disposal unit, mangling it useless. Revenge inevitably follows, and you can imagine the rest, and probably everything leading up to it. The film has a flatness to it. It’s devoid of tension, and mimics Charles Rane himself – cold, unmoved, and seemingly incapable of losing control. It, and Rane, are restrained, not over the top, refusing to let go until it is really necessary and then only doing so with precision and efficiency. When Rane is being tortured at the hands of Best’s bad guys, he is grimly silently, retreating back into the mental cell he used to survive his imprisonment. He is repeatedly punched, but we barely hear the impact on the audio track. When his hand is butchered in the waste disposal unit, there is no whizzing, meat-mincing whirr. It’s a practically silent scene. Only guns have any real audio impact, possibly because the rest of the violence is muted. He is as unmoved when his wife reveals her infidelity, and simply relocates to the toolshed to sleep while Cliff, his replacement, lives in the house and continues playing father to the son. Cliff visits Rane in the shed, awkwardly trying to explain the situation but finds his lover’s husband seemingly unbothered. Rane prompts Cliff into asking about his torture while a POW and then has Cliff tie him up and inflict the same punishment he received in captivity. That Rane is evidently preferring his time bound and beaten is understandable, after all, he’s not got much fun at home, but he is also using it as subtle and silent weapon against Cliff, who eventually recoils in horror and disgust at Rane. Even the attentions of local bar maid Linda cannot penetrate Rane’s shell. Rane simply uses Linda in his hunt for the killers, sending her into shady Mexican bars to ask questions, while he creeps in the back door, sharpened hook at the ready. 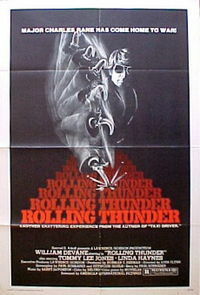 This misuse causes some understandable bitterness, but Rane eventually caves to her charms, only to leave her the next day and go back to find Tommy Lee Jones’ Johnny Voden for the film’s bullet-strewn climax. Rane only really cares about his son and the moping Voden. Unable to find a coping mechanism for civvy street, Voden is seen sporadically, coming to Rane’s aid after he loses his hand and delighted to help his friend kill people. 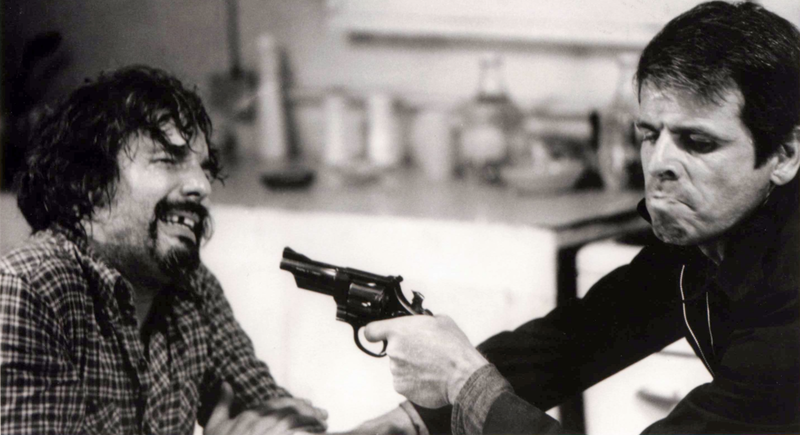 When the guns do start blazing, he is happy and smiling for the first time in the film. Wounds are sustained and shells exchanged as the two men blast their way through the brothel where revenge is exacted. And then it ends. Almost immediately after the last bullet is fired. No happy ending, no return to Linda, no “five years later” reflection. It’s job done, film done.